It's an early Thursday morning. Another morning flight was waiting for me. 2 short 2 hours flight each. I am flying to Tambolaka, the capital of South West Sumba, to begin my 3 days roadtrip around the island. This time I'm going solo. KANO has especially assigned me in this trip, to see what makes this island so special and also to capture a little bit of it. Recently Sumba has gained so much popularity, mostly because of the social media, and it is the location of the best resort in the world. Many people are also tired of spending their time in touristy destinations , and started to look around for an 'off beaten path' destinations, where there are less tourist and more adventure. Sumba seems to be just the right place for that. Relatively close to many touristy islands like Bali, Lombok and Komodo. This island certainly offers one of the last off beaten adventure in Central Indonesia Region. This journey started from a city in South West Sumba, Tambolaka and heading further east as the days gone by. Bwanna Beach. Had all the beach for myself until some local kids came to join the fun. Some local kids having some fun in the lagoon just before the sunset. I was, again, the only tourist there. Great local vibe. Most of the roads to the tourist destinations here are unpaved and often you have to go through some farms to get to the destinations. Sunrise in the resort at South West Sumba and Waikelosawah, a natural spring inside a cave. A hidden village I stumbled upon my way to East Sumba. As I'm approaching East Sumba, the landscape changes. Those greeneries started to fade out becoming more open space and vast savannah. This place is insane! It's called Bukit Wairinding. A hill(-y) yellow(ish) savannah. Some local kids playing around enjoying the beauty of this place, while their parents collecting some grass for the livestock. Horses roam free here in Puru Kambera savannah. Horse is one of the main livestocks here. They've got some races planned over the course of the year. And they really take these races seriously. I've never quite seen a sunset like that. The colors of the sky, the beach, and the vibe. 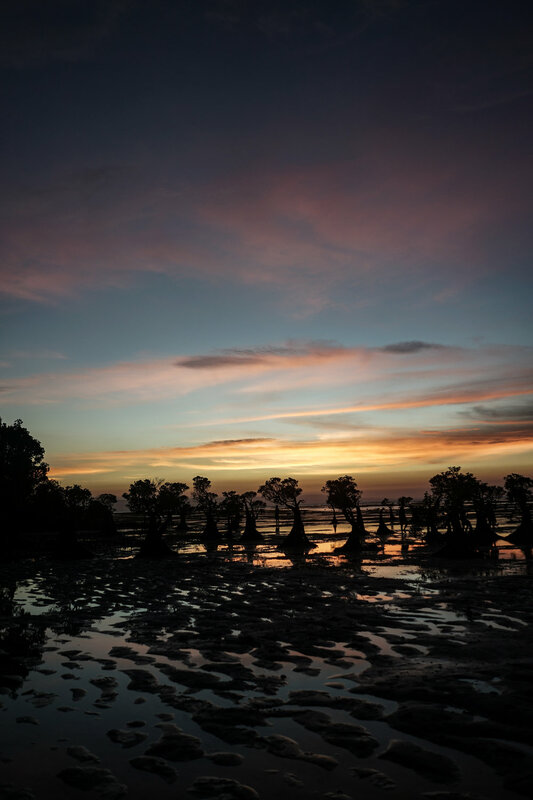 Those weird looking mangroves trees, especially made the sunset ever more dramatic. Just amazing. I tried to shoot from so many different angles, and just getting unique perspective each time. Really fun session there. Best sunset spot ever! It's been an epic journey. I think Sumba is such an underrated destination. Many people stopped in Komodo or Bali, but this one is just so unique and a lot less touristy. Definitely coming back for more epicness.